Michigan family history researchers are fortunate to have a wealth of free death records available online at their fingertips. Between FamilySearch and Seeking Michigan, researchers have free digital access to every state-level death recorded in the state of Michigan from 1867 to 1920. However, a significant gap exists between 1921 and 1970, before the Michigan Deaths, 1971-1996 collection (available at both FamilySearch and Ancestry) begins. Some of that nearly 50-year chasm can be crossed with the excellent FamilySearch database “Michigan Deaths & Burials, 1800-1995,” but not all of it. Indeed, with that particular database, “Michigan” is not statewide, nor does every county include that impressive two hundred year collection of records. Many of the abstracted county-level records go up to the 1920’s and beyond, but again, only for selected counties. Other counties have additional years, other have fewer, it depends on the particular county of interest. Therefore, researchers interested in a death record from the 1930’s, for example, are presented with a quandary. With no online database for the time period, researchers need to utilize alternative sources that can identify their ancestors’ exact date of death. One such alternative is the Index to Michigan Masonic Deaths available here at my web site. Containing more than 8,200 extractions from the Transactions of the Grand Lodge of Free & Accepted Masons of the State of Michigan, the site currently covers the 1933-1936 volumes, which largely includes deaths from 1932-1935. Researchers will find the decedent’s name, death date, lodge name, number, and location in Michigan, all important clues for finding obituaries, death records, and much more. Listed in the 1936 volume of the Transactions, Christian Vahs died on 9 August 1935 as a member of Bellevue Lodge No. 83 in Bellevue. Once the death date and local lodge are identified, locating a newspaper is fairly straightforward. The largest collection of Michigan newspapers can be found onsite at the Library of Michigan in Lansing. According to the Library’s web site, their Eaton County newspaper holdings include the Bellevue Gazette. 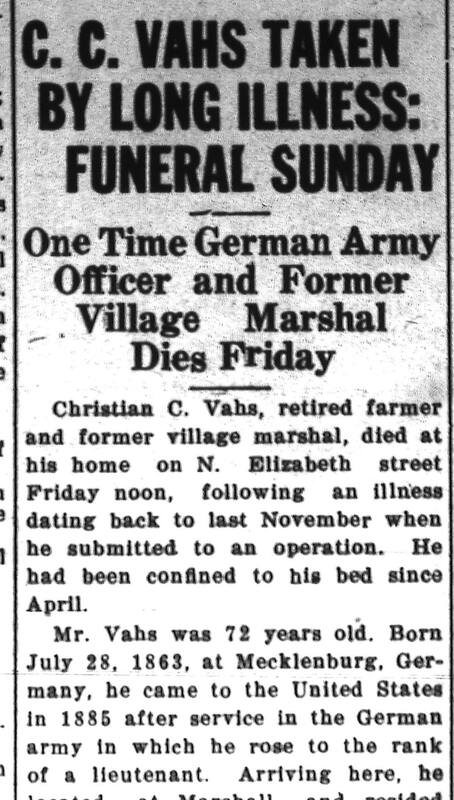 After a few minutes of scanning the microfilm in early August 1935, the Vahs obituary is found. Success! Bellevue (MI) Gazette, 15 Aug 1935, p. 1, col. 4. The extensive obituary continues on and reveals Christian’s wife’s name, where they married, surviving family members, fraternal membership, funeral date, and the cemetery name. Add in the military service information and birthplace in Germany, we are presented with quite the genealogical haul! Using the death information revealed in the obituary, a researcher could then easily find the county-level death record at the Eaton County Clerk’s office or the state-level certificate at the Vital Records Office of the Michigan Department of Community Health. Michigan counties’ vital records fees are typically less expensive than the state’s. Using the Michigan Masonic death index here at this site can serve as an alternative source to help researchers locate their ancestors’ death record, particularly during the 1930’s. The 50-year gap facing Michigan researchers is now not as insurmountable as at first glance. I’ll be adding additional years to my death index, so stay tuned!